If coming from A470 take the Bogey road (through the Miller Argent open cast mine) to a T-junction. At the T-junction go right, then pull up on the right at the lay-by and park. If coming from heads of the valleys road (A465) you should take the exit for Asda (take a right at the mini roundabout immediately after coming off the main roundabout (not into Asda)) and then take the next right under the bridge. Follow this road up until the lay-by on your right, by the boulders and entrance. Alternatively approach from Deri via minor roads from the south. When driving be careful of stray sheep on the roads. Access to the hill is not possible via the main track entrance (it is blocked with large boulders). You must park along the side of the public road in the lay-by and walk up to the take-off. If the lay-by is full (it can accommodate 4 cars), then park in the blocked entrance area but don’t block other cars in. There have been break-ins and thefts in the area, and it is difficult to see your car from the top of the hill unless you are flying – do not leave valuables on display. Carry up the face of the hill to take-off. A short but sharp carry up. Beware of the many deep fissures close to the edge of the hill. The ground will be boggy at the foot of the hill if it has been raining. The hill is less steep (with less of a venturi) than Merthyr Common, so strong winds at take-off are likely to be close to the real wind speed. It is common for people to take off from the foot of the hill when it is strong at the top. However, know your own limits, you are advised not to do this without assessing wind speed and true direction on the top first. Mynydd Fochriw looking along the ridge to the north. On the left is the solar farm (a good thermal source). Photo courtesy of Marcus Woodbridge. There is a large flat top landing area (A). Bottom land at (B) on the up-slope side of the mine track. Do not land on the other side of the track, or in any of the fields. 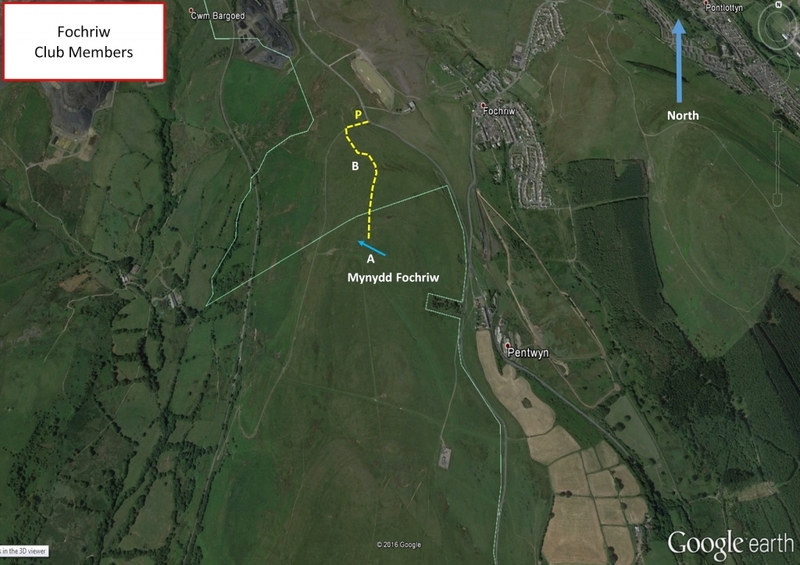 Flying Mynydd Fochriw will give you a view of the mine to your right and another the popular flying site Merthyr Common straight ahead. Overall a fairly friendly site. Often flyable when Merthyr is blown out for paragliders. Wave is not uncommon further out from the hill in stronger winds. The easy access and limited but friendly ridge space can make this site very busy at times, so make sure you are proficient at flying with others. At the South end watch out for paramotors taking off from, or landing at, Bedlinog. This site is often used by local schools. Please be considerate to this fact. Ground handling is often practiced in the landing areas. School are to carry out a dynamic risk assessment to determine if this is suitable prior to starting teaching activities. This site has excellent potential for XC especially in recent years with the open cast mining and greater thermic activity although Merthyr Common is usually favoured for XC. Thermals will often be generated in the valley in front as it’s well sheltered in the lee of Merthyr Common in a westerly wind, or the open cast mine in a north westerly wind. Good thermal triggers tend to include the farm buildings in the valley out front and the solar farm. You’ll need to first escape the valleys before getting into the flat lands where you can push for distance as the ground drops away. 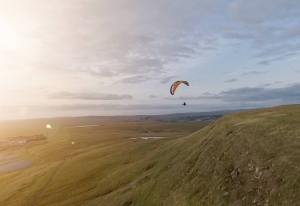 As a general rule stay as high as possible over the valleys to have plenty of landing options. Don’t track too far south or you’ll end up boxed in by the River Severn and the airspace – as a general rule don’t go further south than Pontypool (easily recognised as the distinct southerly notch in the final valleys ridge when flying west). PG – Nicholas Watts flew 49.5 km on his Advance Sigma 8 on 14 March 2013. 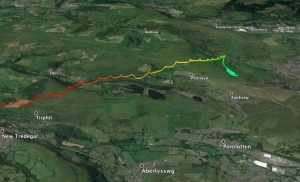 One route away from Fochriw and out of the valleys – note how this pilot took a slow climb from the farm buildings out front and stuck with it across most of the valleys to escape the high ground. Getting back via public transport – the nearest valleys train stations are Pontlottyn (on the Rhymney line) and Troedyrhiw (on the Merthyr line – although this train station is further away). Buses run up to Fochriw from Bargoed train station fairly frequently. Fochriw Mountain 0.8km from Fochriw village. 4km SSE of Dowlais Top on the A465.